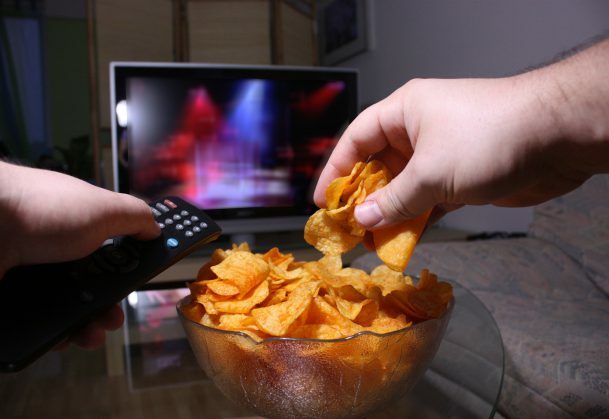 Almost half of our meals in Western society are consumed in front of a TV. We nosh on fast-food while driving, we snack constantly while working at the office — all in all, we’re paying less attention to our food these days. Research suggests that in addition to making us eat more, distractions during meals may also make our food taste different. In a set of experiments published in Psychological Science, Lotte van Dillen of Leiden University and Reine van der Wal of Raboud University Nijmegen revealed that salty, sweet, and sour foods are perceived differently when we’re distracted by a memory task. After memorizing a 1- or 7-digit number, participants consumed strong or weak concentrations of sour lemon juice, sweet grenadine syrup in water, or salty crackers. After the tasting, participants were asked to rate how flavorful the snack was. Overall, they rated the substances as tasting weaker when they were especially distracted. And this effect was more pronounced for the intense versions of the three flavors. The researchers suggest that, because of the distraction, participants were not able to fully perceive the taste sensation. Indeed, data from another experiment revealed that participants consumed more food in order to obtain the same preferred taste level. When they were allowed to eat as many crackers as they wanted, those participants who were distracted ate more of the salty variety than those who weren’t distracted, and also added more sugar to their lemonade. So next time you’re eating dinner, switch off the TV. Your taste buds will thank you.